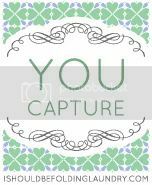 You Capture has a new home for two weeks....what? you haven't heard? Beth is snuggling her newborn baby boy and Keli is hosting the next two weeks. Go check out this beautiful bundle of love and then link up at Keli's for more You Capture. Happy Feet touching the warm grass after being stuffed in boots all winter. Duck feet and little boy feet. now that the Nutella jar is empty! Join Beth to see who else is REACHING. Psssst, as long as you're here - check out my giveaway. I am a Reading Mom. I love to read. Books, magazines, blogs, makes no difference, I love all of them. I began reading to my son shortly after I learned I was pregnant. If memory serves me correctly it was a Little Golden Book, titled The Gingerbread Man. Long before the Internet and digital books, I read that story to him every night so that he would become accustomed to the sound of my voice. Check out Chicago Moms Blog to read the rest. Be sure to look around at all the other great posts too. Suri and Shiloh got nothin' on this boy's sense of style. Passing the time waiting for the bus. Best $2 I ever spent a garage sale - CandyLand Castle! We love this game. It's quick, it's easy, it's educational and it doesn't make me bonkers when I play it eleventy billion times. Yes those are pajamas, or as we refer to them, jambos and yes, I sent my grandson to school like that today. Paleese. Don't judge and don't tell me you've NEVER done THAT! Besides its was a Spirit Day. This week the 3rd and 4th graders at his school were taking the ISAT (Illinos Standards Achievement Test). In support of their hard work, today was Wear Pajamas Day to say, "relax it's over, you did a great job." TOF was up at the crack of dawn, ready to get dressed into his pajamas LOL. It's important to get excited over this kind of stuff and excited he was, just look a that cheesey grin. Monday, TOF and I made a trip to Family Court. I'm not a stranger to Family Court, it's typically a place where people hash out their differences regarding child custody and/or support. But Monday was different, everyone was happy and I didn't feel the usual stress and tension. We had the honor of attending the Adoption Finalization Hearing for our long time neighbors and dear friends. Really decent people, professionals, who I never had a doubt would make awesome parents someday. Unfortunately, infertility reared it's ugly head and the road to adoption was a difficult one with several birth mothers changing their mind shortly after delivery. 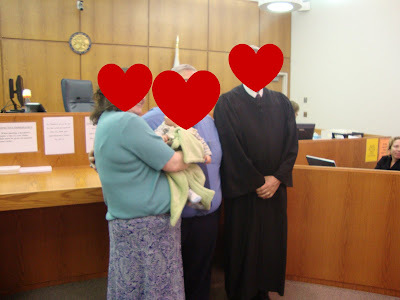 Through it all, this is a couple that remained HOPEFUL and their persistence finally paid off when on March 1, 2010, the judge declared Baby Jay Z no longer their foster son, nor their adopted son, but their son, in the same way and with all the same rights as any child that would have been naturally born to them. When he brought down his gavel there wasn't a dry eye in the courtroom. Thanks for stopping by, be sure to check out all the other HOPEFUL posts today.